After sixteen years, world titles in four weight classes and many memorable fights with some of boxing’s best, Miguel Cotto will call it a career on December 2nd when he faces Sadam Ali at Madison Square Garden in New York. While Ali isn’t the big name opponent that some expected, let’s be honest, Cotto was never going to fight Gennady Golovkin or Canelo Alvarez. Ali however will be a worthy sendoff for in my eyes arguably one of the most underappreciated boxers of this era to casual fans. Cotto may not have the undefeated record like Floyd Mayweather or rumbled through weight classes like Manny Pacquiao, but he’s one of the most important fighters in the last two decades who never backed down from an opponent, no matter their age, size or strength. Which in an era where PPV sales and live gates increased to record numbers, a fighter like Cotto was beyond appreciated. You’ll be hard pressed to find another fighter who faced peak level opposition like Cotto did. He never waited for the “right time” to take on an opponent. Look at his resume for proof: Zab Judah, Shane Mosley, Antonio Margarito, Manny Pacquiao, Floyd Mayweather, Sergio Martinez and Canelo Alvarez are just a few of the names that he faced. Not to mention the likes of Paulie Malignaggi, DeMarcus Corley, Carlos Quintana, Austin Trout, and Joshua Clottey. If you wanted to fight Miguel Cotto, and in return Miguel Cotto wanted to fight you, it happens, and it was very rare that you’d ever find him in a non-action fight. The Cotto vs Margarito fight is one of those forgotten greats. Cotto set a fierce pace early and outboxed Margarito in the early rounds but Margarito’s length and strength played a major role as he clawed his way back into the fight. It was a brutal fight and while Cotto may have lost by 11th round TKO, it was one hell of a fight. We may never know if Margarito cheated that night, although every bit of proof has been present including Margarito being caught with plaster wraps in his next fight against Shane Mosley. While his career after that loss featured some big wins at Welterweight and at Middleweight, the question for Cotto’s career will always be, what if Cotto didn’t fight Antonio Margarito on that fateful July night in 2008? The beating he put on Cotto as the fight progressed certainly took some years off the Puerto Rican legend’s career. Miguel Cotto doesn’t get the credit he deserves for fighting the top guys at the time he did. He fought a prime Pacquiao who was in the midst of a destructive run through multiple divisions. He fought a prime Mayweather who was as dominant as ever with his defense and counter punching. In both fights he gave each fighter all they could handle. 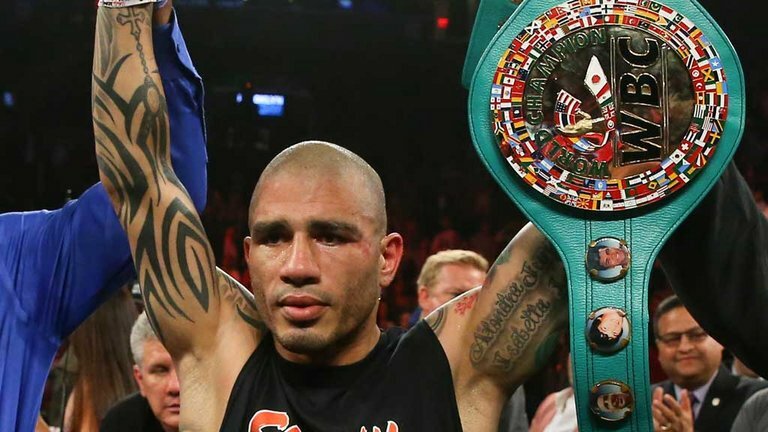 In basketball hall of famer Charles Barkley was outshined by era legends such as Michael Jordan and Hakeem Olajuwon, and in sports often times one’s greatness overshadows the goodness in other athletes, which is the story of Miguel Cotto’s career. Not to say that he doesn’t have a loyal following, because Madison Square Garden should be packed for his going away party. But Cotto’s name gets lost in the mix when talking about boxing’s best. He may not have won every fight, but he never let boxing fans down when he stepped between the ropes. Cotto is a guaranteed Hall of Famer, and in December he will do as he always does, which is giving us a show to remember!